If you've been following my blog, you'll know that I've reviewed a few GMO crops where I've questioned the health benefits that are being touted by crop developers. The few that stand out are the claim that decreasing the amount of acrylamide when frying the Innate potato is beneficial and the claim that increasing the amount of antioxidants in crops is healthier (such as the pink pineapple). The links that I've provided above are to previous posts where I reviewed these crops, how the traits work, and the benefits of the crops. To sum up what I wrote before, there's little evidence to support the idea that increasing antioxidants in your diet is healthier. Undoubtedly, there are benefits to increasing the amount of fruits and vegetables that we eat, but there's not much evidence to support the idea that eating fruits and vegetables that are more "colorful" and therefore richer in antioxidants is better. Additionally, there's little evidence to support the idea that the acrylamide that is created when potatoes are fried is harmful. Acrylamide in large amounts is known to be harmful. One can easily argue that the fat/calories that you'd have to eat in order to be harmed by the acrylamide in the potatoes will kill you first. Yet I see GMO supporters using the argument that these GMOs are beneficial time and time again. Not only is it unnecessary, but it's poor science. The fact of the matter is that if a company wants to make orange brussel sprouts or black watermelons, they have the right to do so. Once the crop goes through the regulatory process, they'll have the right to grow and sell them. Some GMO crops will have environmental benefits, health benefits, or benefits to farmers. But not all of them have to. My perspective is that these crops were developed at a time when the science suggested that these traits were necessary. Think about the antioxidant craze 5-10 years ago. But with time, science has advanced and the body of evidence suggests that increased antioxidants don't necessarily prevent disease. 5-10 years ago, we also thought that acrylamide in potatoes might be harmful. But today? Not so much. If a crop is more sustainable or healthier, then the importance of the trait should be stressed. The Innate potato, for example, will have a non-browning trait in addition to the reduced-acrylamide trait, so there's good reason to purchase it in terms of decreasing food waste. But if a GM crop doesn't have a beneficial trait, if the trait introduced is purely cosmetic in nature, then that's OK too. Because sometimes a pink pineapple is just a pink pineapple. And you know what? Maybe a bunch of kids will eat more pineapples because they'll get a kick out of it. Or maybe some fancy chef will win the final challenge in Chopped because they'll make pink pineapple ice cream. 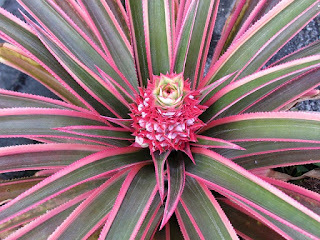 You have to assume that whatever company is making the pink pineapple has done sufficient market analysis to know that people are interested in and want their crop.